A cube is a set of predetermined Magic cards, typically greater than 250 cards, each card generally unique, that can be used in a Magic draft format (see How to play the draft format section below). Typically, a 250 card cube would be good enough for 4 players, whereas, a 400 plus card cube might be best for an 8-player draft. Having more cards in the cube makes it possible to have a less predictable draw, since not all the cards get drawn every draft. A pauper cube is a cube which cards are all valid in the pauper format. A card is valid in the pauper format if it was released as a common in at least one set. For instance, even though Rancor was released as an uncommon in M13, it is still considered valid in pauper because it was released as a common in Urza's Legacy. Once the three rounds of draft are over, each player should be left with 45 cards. It is now time to build decks. 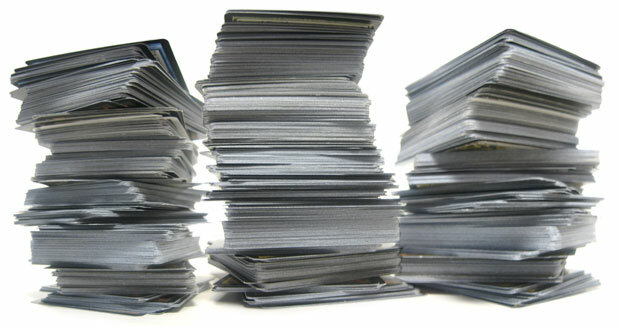 Each players builds a 40-card deck with the cards he/she has drafted. Around 23 of the 45 cards drafted will likely be used in a typical deck. The rest of the cards for the 40-card deck will be picked from a pool of basic lands (players can take as many basic lands as needed from the land pool to complement their deck). In the end, there should be roughly 17 lands (probably 14 basic and 3 drafted lands), 15 to 17 creatures and the rest shoud be instant, sorcery and enchantment spells (6 to 8). Blue color focused deck may have less creatures and more instant/sorcery spells. White and red decks may have more creatures, depending on the desired strategy. What is the Commoner cube? The Commoner cube is a pauper cube that I designed in the summer of 2013. The breakdown of the number of creatures, enchantments, instant and sorcery spells is different for each color, based on typical strategy that each color implements. For instance, since blue color has the tendancy to focus less on creatures, more on instant and sorcery spells, this version of the Commoner cube has a lower count of blue creatures than other colors, but the pool of non-creatures blue spells is bigger than other colors. The artifacts provided in the Commoner cube are divided in four categories: Equipments, creatures, utilities and mana fixers. The mana fixers provide access to a larger mana pool, including greater color diversity. The lands that are part of the Commoner cube provide either access to a greater color diversity or some tools to create more interactions in the gameplay. The presence of a good pool of gold and hybrid color cards along with lands that give access to more than one color and artifact mana fixers should provide incentive for players to hopefully draw cards in two or three colors and create more diverse decks and strategies. Why would you want to play the Commoner cube? Why would you not? No, seriously, the idea behind the Commoner cube is to provide an affordable environment to play Magic that is accessible to a large audience and where everybody has a chance to win. Sounds like fun, no? Although this is not the main focus, the Commoner cube should be quite fun for less experienced players who want to learn the fundamentals of Magic. What is the Epic cube? The Epic cube is a MTG cube that I designed as an experiment with most of the best cards ever created. The Epic cube leverages some of the best cards that Magic has ever released. The Epic cube features 639 cards, 84 for each colors, 143 colorless and 72 multicolor cards. I have tried to balance each color. The mana curve of each color has been designed according to the usual color requirement. For instance, red color mana curve focuses on lower casting cost spells, which can provide early board presence and a more aggressive strategy, while green color expects access to a larger mana pool to enable the casting of bigger creature spells, which requires a ramp up that can be provided with other green creature and sorcery spells. The breakdown of the number of creatures, enchantments, instant and sorcery spells is different for each color, based on the typical strategy that each color implements. For instance, since blue color has the tendancy to focus less on creatures, more on instant and sorcery spells, this version of the Epic cube has a lower count of blue creatures than other colors, but the pool of non-creatures blue spells is bigger than other colors. The artifacts provided in the Epic cube are divided in four categories: Equipments, creatures, utilities and mana fixers. The mana fixers allow the the players to get access to more mana and greater color diversity. The dual lands and fetch lands that are part of the Epic cube are great as mana fixer for multicolor decks. Also included in the cube are some of the more popular lands used as tools to create more interactions in the gameplay. The presence of a good pool of multicolor cards along with lands that give access to multiple colors and artifact mana fixers should provide incentive for players to draw cards in two or three colors and create more diverse decks and strategies. This cube features some of the most powerful MTG cards, including the power 9 cards and many others such as Library of Alexandria, Umezawa's Jitte, Yawgmoth's Will and Sensei's Divining Top. It features several legacy and modern staple cards, including many of the older and newer dominant planeswalkers. What is the Tribal cube? The Trbal cube is a MTG cube that I designed to feature some of the most popular Magic tribes. The Trbal cube features 470 cards, 63 for each colors, 94 colorless and 61 multicolor cards. The Tribal cube is smaller in size than the other cubes I designed like the Commoner cube or the Epic cube to make it easier for the players to draft enough cards of the tribe of their choice. The major tribes per color are: soldiers for white, wizards for blue, zombies for black, goblins for red and elves for green. Each color has a secondary tribe: cleric for white, merfolk for blue, vampire for black, shaman for red and green. Colorless has some myrs and some golem creatures, which could be considered secondary tribes as well. Two additional tribes are also represented, but spread out in the different colors: elementals and warriors. Some tribes like shamans have a good representation in two colors (green and red), while others are mostly present in one color, but have some presence in a secondary color. This is the case for goblins, which are mostly found in red, but there are a few goblins in black to favor the black-red color combination. Similarly, vampires are mostly concentrated in black, but there are a few vampires in red, again, to make a stronger connection between black and red. I avoided tribes like angels, dragons and slivers because I felt they would overpower tribes like goblins, elves and soldiers. There are many changelings in the cube, which is pretty convenient to get a greater count of creatures of a specific type. There are many cards that can buff creatures that share a specific creature type, like Coat of Arms, Alpha Status and Obelisk of Urd. Some other cards are there to buff creatures or give them some new abilities, regardless of their creature type (Mikaeus, the Lunarch, Frontline Medic, Champion of Lambholt, and Furystoke Giant). Some cards play with the creature type, like Amoeboid Changeling, Ego Erasure, and Conspiracy. Each tribe has a number of generals to increase power and toughness of each tribe member and some cards to generate tokens. The format of the cube is Eternal, but there are only a few cards that come from outside Modern. I also tried to use as many different cards as the Epic cube as possible to make both cubes unique. What is the Guild cube? The Guild cube is a MTG cube that I designed to feature some of the best cards from the Ravnica block, the Return to Ravnica block and the Guilds of Ravnica set. The Guild cube features 435 cards, 41 for each colors, 70 colorless and 160 multicolor cards. The Guild cube is smaller in size than the other cubes I designed like the Commoner cube or the Epic cube to make it easier for the players to draft enough cards of the guild of their choice. Cube is a multiplayer draft format. The Commoner Cube is a fun way to play Magic with friends. The Epic cube leverages some of the best Magic cards ever released. The Tribal cube leverages some of the most popular Magic tribes. The Guild cube leverages some of the most popular cards from the Ravnica block, Return to Ravnica block and Guilds of Ravnica set.